st mornings and some afternoons too. I dash into the garden and grab a bowlful of leafy greens or vegies and mix them with microgreens, sprouts and fruit. 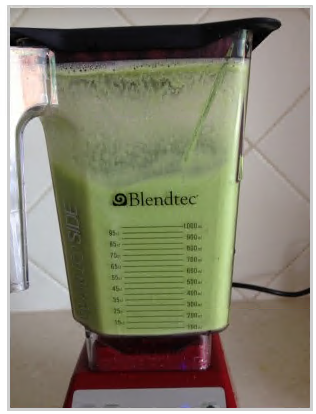 The Blendtec blender whips it all so smooth! This is an especially delicious smoothie we had a week or two ago. Mix together two fresh pineapple slices, a wedge of green or yellow melon, ½ cup seedless grapes and some leafy greens. I used baby Asian greens (Tatsoi), sweet leaf and sorrel and threw in some of our own micro greens- lentil and wheatgrass. If you don’t have a speed blender, then just run your blender for 30 seconds or more to get a smoother result. Some folks like a chilled drink so add some ice cubes before blending.